Pizza & Game Night: Pizza can be a variety made by children and staff (Boboli, English muffin and Bagel or purchased by the program. Parents can also sign up to bring a pizza or other goodies! Games can be in the gym (See Gym Games) and/or more quiet Table and Thinking Games. Talent-Variety Show: Open this up to a variety of choices! Showcase children and children with their parents; also include staff members! Drama Production Theater Night – Children perform original or well known skits and plays. Create an After-School Experience for Parent Participation. Use centers and open gym–provide snacks; have parents do what the children do! Pastries for Parents- Hold this in the evening or during an afternoon at SAC. Goodies for Grandparents: Any time would be a good time; however, Grandparents Day is the second Sunday in September. How about doing this in September? Muffins for Mom. For a Mother’s Day celebration, Mom (or a favorite person) spends some morning time at the program. Children can give presents and cards they have made. Also offer muffins, fruit, etc. Mother’s Day Tea. The same as above except in the afternoon with tea and cookies! 21. Father’s Day Happy Hour. Around 4:00 (or later) in the afternoon, fathers have root beer and popcorn with their children and teachers. The children can invite a “Favorite Guy” if Father is not available. During this time the children present gifts and cards that they have made…a great way to get more Dads involved! Ice Cream Eating-No Hands Used! Give each child a scoop or two of ice-cream in a bowl. Have them sit comfortably at a table …. Be sure to Video Tape and Take Pictures! ‘I Scream For Ice-Cream’! Pair this up with your ice-cream social. Which team can say it the loudest? Two years ago we had a Silent Art Auction. Invitations went out well in advance to everyone the children knew…For more than a month children were involved in all types of art projects: drawing, paint, fiber, batik, water color, ink, clay and jewelry making. We matted the children’s art and displayed it from 5:00 until 7:30. We indicated the opening bids in dollar amount. Families wrote down their offers and put it in a slotted box next to the items. 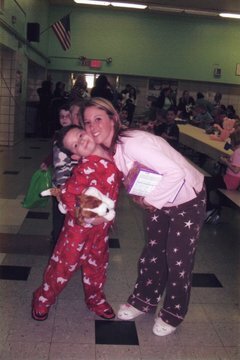 A very large program in Montclair, N.J. (38 staff and 225 children attend daily) offers a PAJAMA CLUB! On Friday nights, staff members operate a pajama club for all students and their siblings, 3 years of age and older. The pajama club offers parents a night out from 7:00 pm–10:00 pm — twice a month for a charge of $12 per child, paid in advance. One of the ways Tasha in California has connected with parents is to “give them a night out” a few times a year! I imagine parents love her for it! Where can you go out and pay child-care of $10.00 for four hours? From Tasha … I have had Parents’ Nights Out, in which we charge $10.00 from 6 pm -10 pm. For one ‘Night Out” Example: Instead of having a party for Halloween during our program time, I had a Halloween Party during a ‘PARENT’S NIGHT OUT’. 55 out of 100 students attended and about another 10-15 students from the school came (they paid the 10.00 fee). I then used the money to pay for extra things on site for parties, etc. — A WIN WIN! Tasha additionally wrote: We also have a ‘Parent’s Night Out’ during other times of the year –such as a ‘Sweetheart’s Ball’ to celebrate Valentine’s Day. This gave parents a chance to go out for the special day. There was lots of participation because my kids loved dancing. We invite families to come to a local park and ask for volunteers to bring different items. (Plates, utensils, napkins, desserts, hot dogs, buns, chips, drinks, etc) We post a sign up sheet for all to see… and Set up centers, play games, music, eat, dance, have fun!!! Something we do is choose a place that will donate a percentage of all the proceeds for a night (for us it’s 15%) to our organization. All the center families get together; enjoy some pizza, laughs and have conversation! It’s great for moral and also a great way to bring everyone together to support the center/program! As suggested by Roberta Newman in” Building Relationships With Parents and Families in School-Age Programs, 2nd Ed., have a White Elephant Auction Night – Each family contributes a usable item (or a mystery object) that they no longer want. One person serves as a “goofy” auctioneer and others bid on the treasures until all are sold. Proceeds can go to purchase an item for the program. I think that Parent-Teacher meetings are often hard for parents to attend or they just don’t “feel like it”—so I came up with the idea to combine the meetings with a “Brag Night”. I use these as a VITAL key in my program. • For the first 20 minutes we watch a VIDEO PRESENTATION of the kids playing and at centers, activities, games, etc. from the past month as well as SHOWING OFF photos, artwork and the projects we have been working on. • During this time we also set up a “PROJECT TABLE” for the children to enjoy while we go over normal things such as center policies, etc. • We also enjoy REFRESHMENTS together! We serve coffee, etc. but I always include a few things that the kids have on a regular basis, such as fun snacks that go with their theme, etc. This gives the parents a chance to see what we eat. • It always turns out well and the parents love seeing their child in their environment as well as with their friends… and they love getting together with other parents and their teacher! help connect your program and staff memebers to the families you serve. Make them as interesting, upbeat and complete as possible. Click here for Tips, Ideas, and Articles to include in your News! SEPTEMBER– GOODIES FOR GRANDPARENTS: Any time would be a good time; however, Grandparents Day is the second Sunday in September. How about doing this in September? OCTOBER–‘LIGHTS ON AFTER SCHOOL— In 2014 it is October 23—There are also many ideas in the Lights’ category that will work for Family Social Events. Weeks ahead Post and Hand-out a Save-the date. Invite parents to attend and have them sign up to bring in foods traditional to Thanksgiving.Serve: Turkey, sweet potatoes, vegetables, cranberry sauce, pies, fruits, etc. Parents then sign up for their choice. Be sure to tell them to bring their contribution ready to go and serve! The program can provide juice, water, sturdy plates, napkins and utensils. ***Think about this! Time is short for us all–however– there are many excellent food stores that make good turkey breasts, chicken pieces, potatoes, fruit, etc. Inform families their contribution does not need to be home-made! Invite families to see how children spend their time! Begin to prepare for “Winterfest” when you return to school after the Holiday break. Early February would be a good time to hold it. → Make invitations NOW. Invite families and VIP’s to join for an evening of fun, music, and treats to eat. → Start the event after dinner time but provide goodies that parents can sign up to bring. If your budget is low—you can also include items such as hot cups, napkins and utensils. You can provide the cocoa and/or warm cider punch and water. Set up “centers” for the event. Each group or team of children with an adult facilitator can choose what they want to do. One group may want to invent winter theme carnival games for guests to enjoy. One group may decide on an easy craft project or two and have everything prepared for their guests to create the projects with them. One group can facilitate gym games. If your group is large group, you may need another center. Another idea is to have an area with “quick” table games or some of the circle games you play. How many centers are set up depend on the size of your program. Guests rotate through the centers. THE EVENING CAN END HERE WITH REFRESHMENTS OR……..
After an hour of enjoying individual activities in centers, gather in a large area for a sing along led by the children—this is also goodie time! Maybe hot cocoa and warm cider punch? Have a yummy treat table which can be supplied by a previous sign-up sheet with family donations. Be sure to instruct families to have all snacks and treats ready to serve and eat. Each team can make their own decorations for each center, but have all children decorate the main gathering room. Children can make a variety of snowflakes from tissue paper, doilies or cut-outs. The day of the event fill balloons with helium. Hang some of the snowflakes and balloons alone and float some balloons attaching snowflakes to them with different lengths of ribbon. If the ceiling is not too high, let these go in the room and they can float to the ceiling. A nice ideas is to hold your sing along under souvenir balloons/snowflakes with children’s name on them! Individual songs can simply be led by the children or different Teams. You can sing to Cd’s, a piano or keyboard. Maybe the music teacher can join the celebration and assist?!!! Just have fun! In celebration of this month–challenge the children to come up with unique and useful inventions! Set up the ingredients in bowls on a buffet table for the families to create their own sundaes. YUMMY! Play some of the fun St. Paddy games from this site! This will need to be starts weeks before Earth Day which is April 22… Display photography, sculpture, drawings, pastels, etc., as well as crafts, toys, and nature projects made by the children. FOCUS EVERYTING ON THE ENVIRONMENT or MADE FROM RECYCLED MATERIALS. Set up your “Exhibit” and Hold a FAMILY EVENT after school. You can also invite school classrooms to walk through and view. Serve refreshments/snacks with an Earth theme…Ideas for snacks are in the Earth Day-Every Day Category. 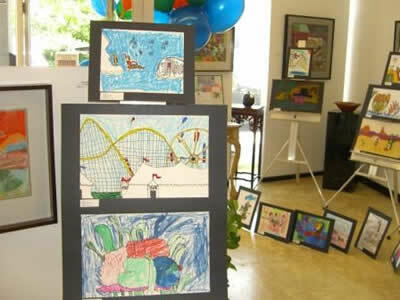 Families enjoy their children’s art as well as their children’s titles and writings. Consider a springtime sidewalk art show to share children’s explorations with art and writing. 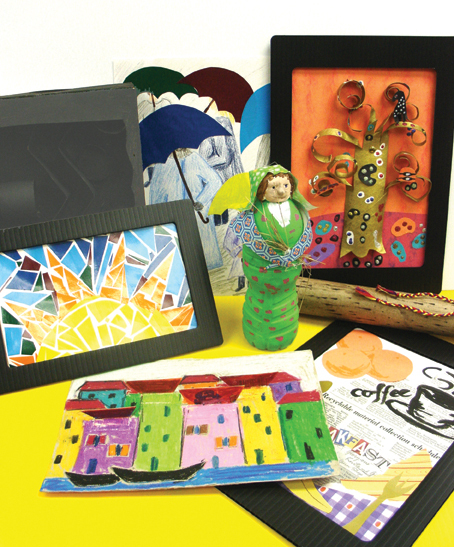 Involve children in mounting and displaying the artwork on the sidewalk or along a hallway. Put up a clothesline and help children hang their mounted works with colorful clothespins. Try attaching children’s names to the clothespins for easy recognition. Ask children to draw “invitation cards” sent home to families with the date and time of the event. For a Mother’s Day celebration, Mom (or a favorite person) spends some morning time at the program/school/classroom. Children can give presents and cards they have made. Also offer muffins, fruit, etc. The same as above except in the afternoon with tea and cookies! MAY IS INVENTORS MONTH…Also check out the Inventions Idea above in February’s Black History Month! May is Inventors Month! The inventions activity for a Parents Event would be awesome! Around 4:00 (or later) in the afternoon, fathers have root beer and popcorn with their children and teachers. The children can invite a “Favorite Guy” if Father is not available. During this time the children present gifts and cards that they have made…a great way to get more Dads involved! I used to have fun with the following idea at our Father’s Day/END OF THE YEAR PARTY EVENTS. (Sorry, I don’t remember where I first saw this–but it’s fun! Cassi in Michigan) This would also be fun at a large family get together. Get together a few families and play the FATHER’S DAY/CHILD GAME. Divide into four father/child teams. Ask the fathers to leave the room while the children sit in chairs. Ask the same four or five questions to each child about their fathers. Bring in the fathers and ask them the same questions. Will the father and child have the same answers? Switch places and see how well the father’s know the children. Award a red rose to the winning father/child team. Question Ideas: Favorite color, movie, candy bar, color of toothbrush, memorable moment with you, best friend, hobby, talent, food, animal, cartoon, pizza topping, ice cream topping, restaurant. Most embarrassing moment. Favorite holiday. JUNE THRU ALL OF SUMMER…Check out the #22 ICE-CREAM SOCIAL! 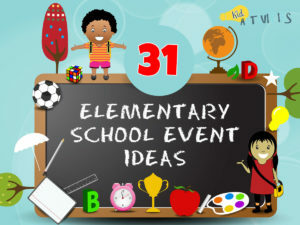 There you have it, 31 elementary school event ideas.